Shown with Included Birthstone Charm. All other charms are optional. This personalized heart and birthstone pendant grouping will be a favorite out of all the presents under the tree! 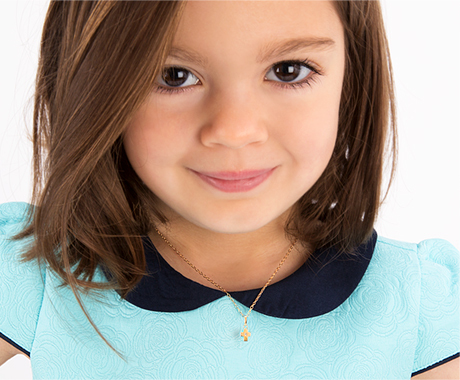 All parts of this necklace are 100% solid sterling silver with a stunning Swarovski® crystal birthstone charm. Entirely unique and tailored to everything that makes her the amazing girl she is. Our professional custom engraving features the child's name, initial, or monogram beautifully. She will want to it show off to everyone! Got this necklace for my niece and it’s beautiful. It came nicely wrapped with the bow and all and also arrived super quick. Got this necklace for my niece. It arrived super fast and came perfectly wrapped and packaged. The perfect length, size and look! My granddaughter will live her tiny blessings gs pendant.